The Fall issue of the Club’s newsletter takes on a different structure. This newsletter is the debut of an alternative orientation, that of being more lifestyle driven. For instance, a member will be featured in each issue. There will still be lifestyle tidbits, leadership columns, and updates on rally news since rallies are a vital part of the Clubs regular activities. The Club’s newsletter takes on a new look along while getting a name - Travelore, combined from the thing we do (travel) with the stories we make (lore). In this issue we bring you up-to-date on the chapter transition as evidenced by recent announcements. Just click on the image at left to download the eNewsletter or use the link below. New Logo, Logo Design Contest Winners, Wyoming Western Adventure Rally in Cody, FMCA Area Rallies, Goshen Rally Report and Membership Renewal & Report. Click on Logo to download and view newsletter. 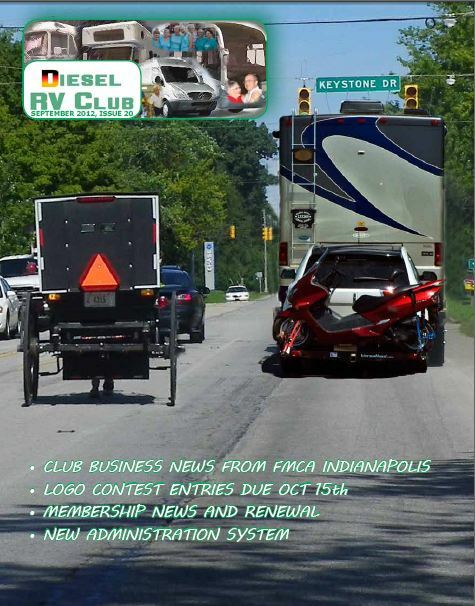 The Chapter’s mission statement has been modified so that it will be a club for RV owners with an interest in diesel engines, how to maintain them, how to get maximum performance, and how to keep repair costs to a minimum. The Chapter’s Rallies combine social and technical programs. There has never been a requirement that one own a Caterpillar powered RV, in fact, the Chapter’s first VP had a Detroit Diesel, but changing the name conveys that RV owners of any diesel coach are eligible for membership. 90% of the “Care and Feeding” of a diesel coach is not inside the engine, but maintenance of the fuel, cooling, air and other chassis systems. These systems are shared by owners of “all color” engines. 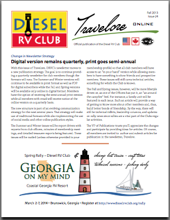 An invitation is being extended to all Diesel RV Club members to participate in a competition to design the new logo for the Chapter. Designs should be submitted to Lee Zaborowski, editor@dieselrvclub.org Additional information can be found at www.dieselrvclub.org or by contacting Ken Carpenter (214) 364-2090. 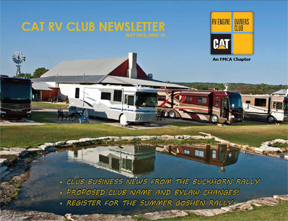 This newsletter reports on the Buckhorn RV Resort Texas Hold 'Em Rally held on April 15 - 20, 2012 in Kerrville, Texas. 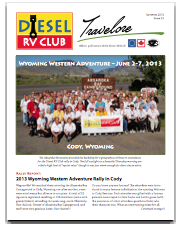 Feature stories include: Rally Attendees Group Photo, Club & FMCA News, Membership Report, Rally Report, Rally Games and Contests, Rally Charity Thankyou, Lazy Days of Summer Rally, Goshen, Indiana Information & Registration, 2013 Rally in Cody, Wyoming.